In the early 1960s, Hap Snow’s Whirlwinds recorded three original songs at the residence of Steve James (Steve Fradkin) including “She” and an early take of “He Can Have Her,” two of the most popular vocal numbers of the band after they moved from Williams College. The Whirlwind players on these two unreleased James’ compositions include James on rhythm guitar and lead vocals, Billy Elgart on drums, Michael Kaye on piano and background vocals, and James K. “Hap” Snow on lead guitar and background vocals. 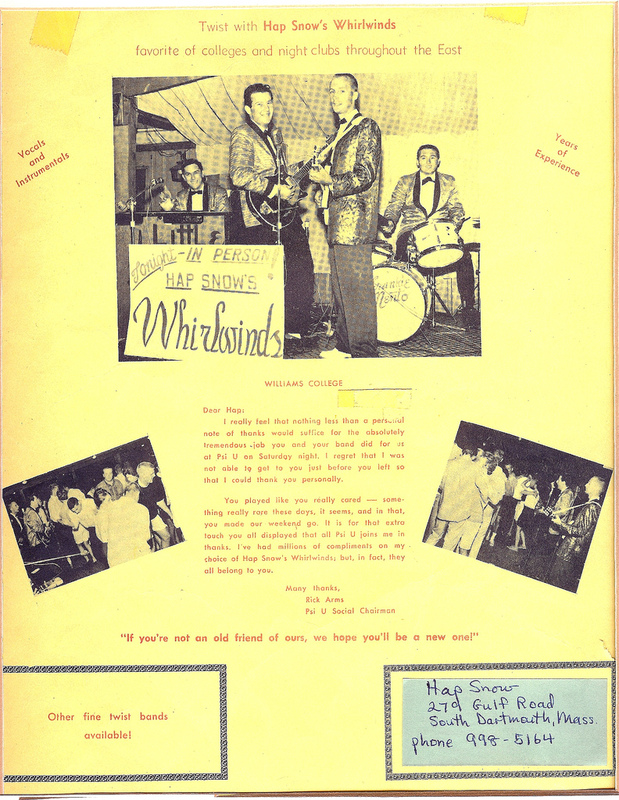 Michael Kaye (far left in the top picture on the handbill) replaced original Whirlwind pianist Art Bearon, who left for medical school in Minnesota, in late 1960. Kaye remained the regular pianist/keyboard player as well as a lead and background vocalist until he joined the service just before the band’s demise in 1966. Images in the video from a stage production of “Fiddler on the Roof” and pictures of Michael Kaye with his two children, son-in-law, and a few of his seven grandchildren are courtesy of Barry Kaye. This entry was posted in Feature, New England Music and tagged "A Lullaby for Emily", "Chantilly Lace", "Fiddler on the Roof", "Georgia on My Mind", "He Can Have Her (Early Take)", "He Can Have Her", "I Can't Fight This Feeling", "Leader of the Band", "New York State of Mind", "She", "Sierra", 60's Rock, Barry Kaye, Billy Elgart, demo, Hap Snow, Hap Snow's Whirlwinds, James K. Snow, Massachusetts Rock, Michael Kaye, New England Rock, Steve Fradkin, Steve James. Bookmark the permalink.